We were supposed to have a perfectly clear sky for the day and somewhere around -10 degrees, with lots of snow, like a proper winter day should be. We started our trip early in the morning from Sibiu. 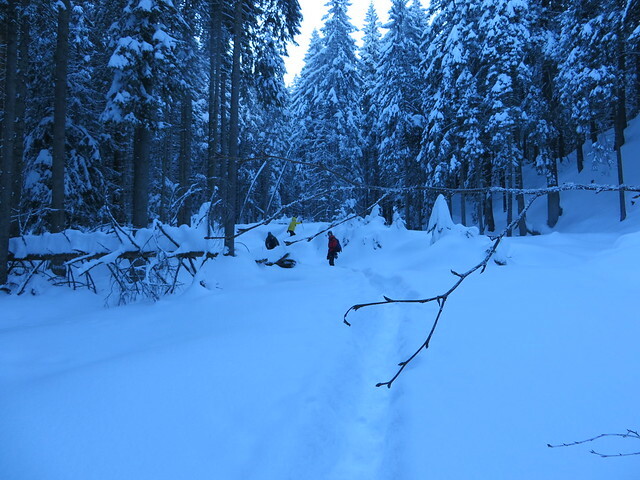 Considering that winter days are so short, waking up at a early hour is a must if you want to do a one day hiking trip. We drove to Sâmbăta de Sus and left our car at the trout farm. 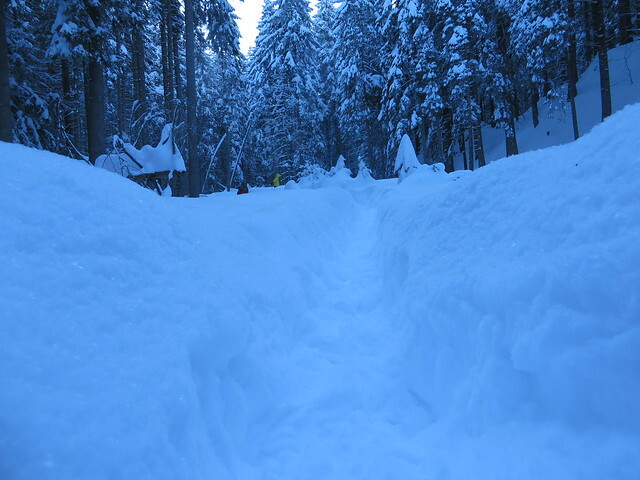 During summer time, you can drive further on the forest road, but this time there was too much snow, and the road was impracticable. The trip up to the Valea Sâmbetei Hut was a true pleasure. 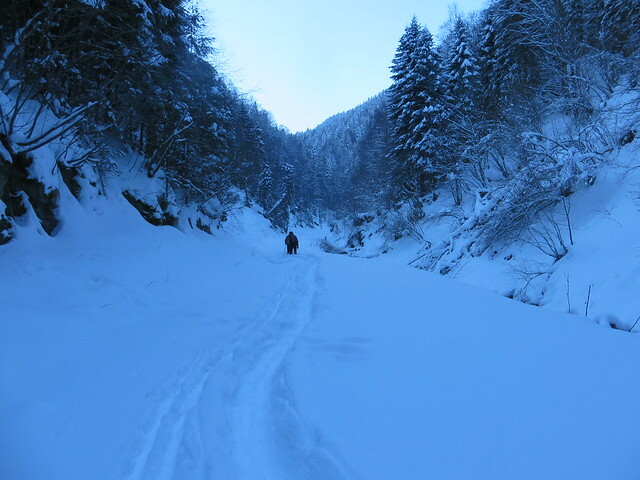 Everything was white and full of snow, the river was almost completely frozen, and a complete silence surrounded us. There was no wind at all and everything looked like it was standing still in time, no movement except our steps in the snow. 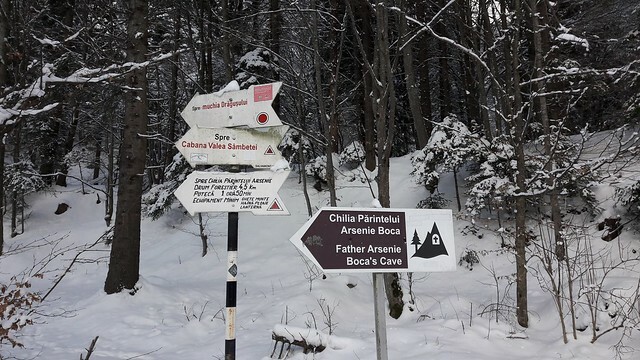 Going up to the Valea Sâmbetei Hut is not a difficult at all. 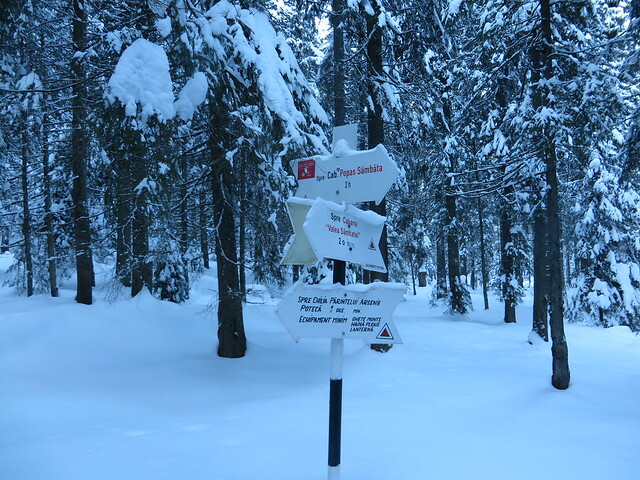 It took us about 2 hours and 30 minutes to get there, considering all the snow and we followed the red triangle path . During summer time, considering that you can drive more on the forest road, you can get up in less than one hour. 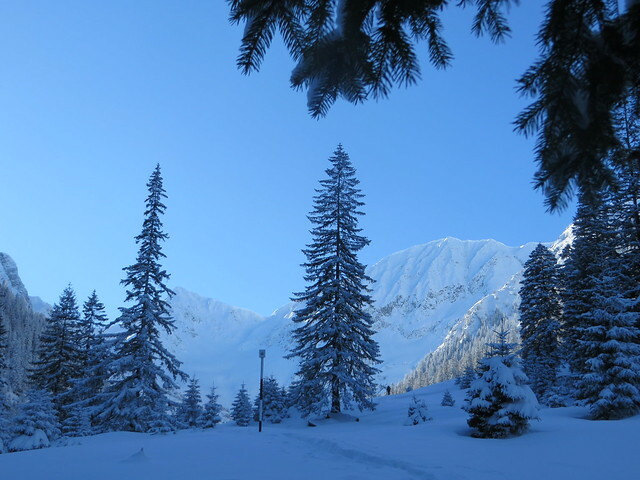 Coming out of the forest, about 30 minutes before getting to the hut, was the first encounter with the Făgăraș Mounatins Ridge. And we were completely amazed by what we had in front of our eyes. Sunny, clear sky and the ridge full of snow. 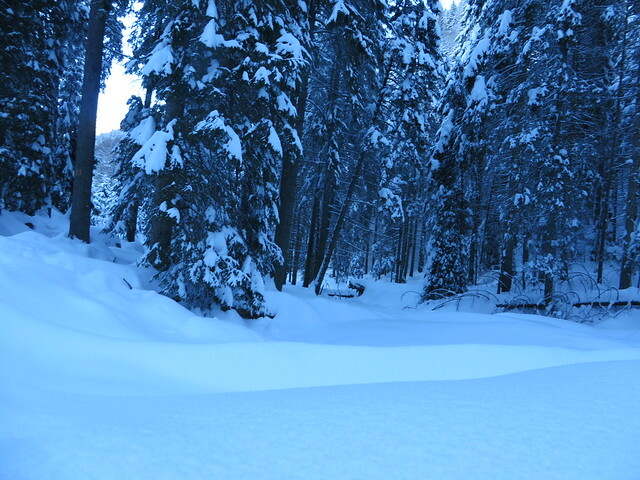 Around us pine trees covered in heavy snow. Just perfect. 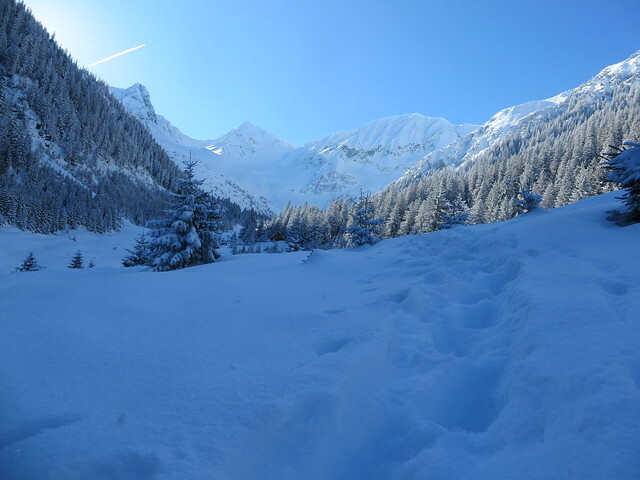 The last part of the hiking trail was a bit more difficult to pass, as the snow was quite big, but still the view compensated for all the effort. Getting to the Hut, we got warm food and a nice fire inside. Still, the weather was so perfect and warm, that we didn’t spend too much time indoor. 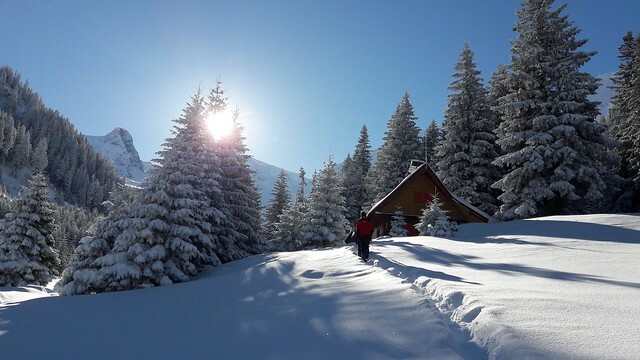 We just wandered around the Hut into the beautiful untouched white snow that was glowing so nicely in the sun. 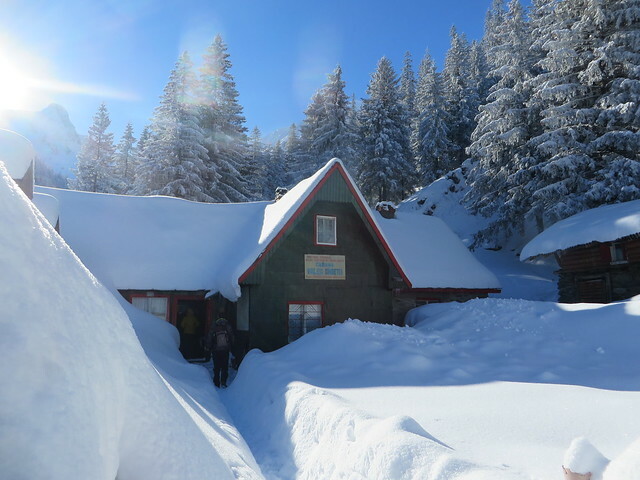 Normally the Valea Sâmbetei Hut is a good starting point if you want to get to the Moldoveanu Peak (highest in Romania), but for us this was not an option. 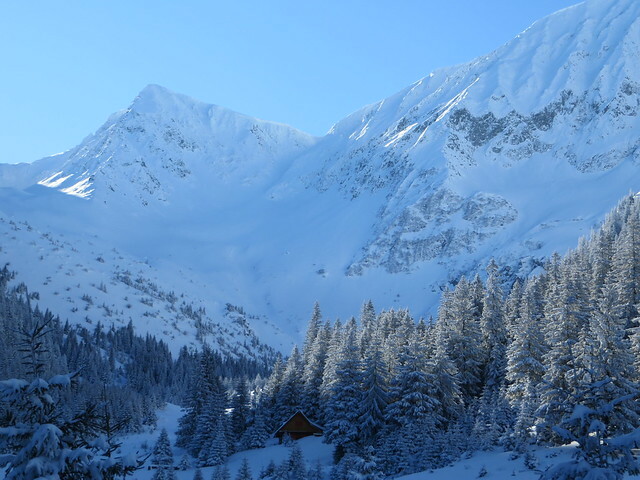 During winter time, it’s not advisable to go on the mountain ridge, even on such a good weather (sun can warm up the snow and start avalanches). 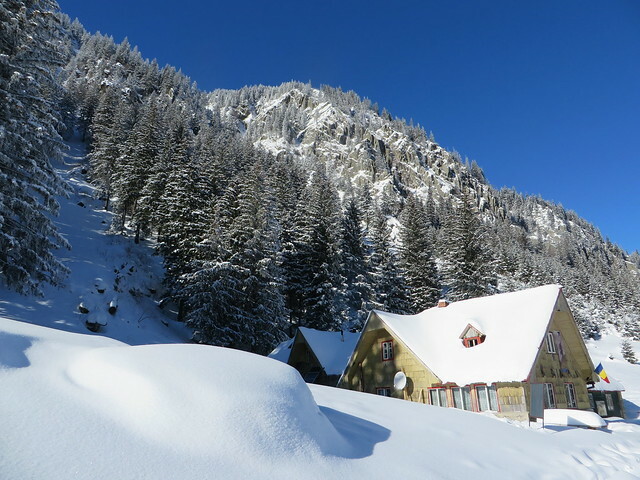 The view at the Valea Sâmbetei Hut is the most spectacular in all the Făgăraș Mountains. Sometimes it seems like a fish-eye photo, but that’s exactly how it looks in reality, with no photo effects. The hut is a classical Romanian mountains hut, a rather old one, but you get accommodation, fire wood (if you come in winter) and warm food (which is not bad at all). After having a nice lunch and enjoying the warm sun, we headed back to Sâmbăta de Sus where we had left our car. Going down was faster, we were back at the car in about 2 hours, just before the sun would have set. And being next to the trout farm, we paid them a visit and bought some fresh trout. It was such a nice escape from the city, perfect weather, amazing view and great companionship for the day.